Let’s face it, there is always work to be done… and if you find yourself in need of a table, a chair, and some free wifi, be sure to check out some of our favorite spots. Urban Grind – There are two in town, and while we prefer the one in NE, the location in the Pearl is easier to get to and not crawling with kids. The NE spot, however, is bigger and they have extension cords running throughout. The coffee is decent, and they do have some food options. The NE location is open until 4pm, and in the Pearl you can stay until 9pm through Saturday, and 7pm on Sunday. Costello’s Travel Caffe – Costello’s may be small, but it is one of my favorite places in town to do a bit of work. The coffee is good, the food is tasty, and the music is almost always excellent. Plus, they have these wonderful flat screen tvs showing scenes from the day’s chosen cities. They are open Thursday, Friday and Saturday until 10pm and Sunday from 9-5. World Cup – Be sure to check out the World Cup at the Ecotrust building in the Pearl (also home to Hot Lips Pizza, yum) for good coffee and free wifi. There is outdoor seating as well. I haven’t been there, but I have heard that the NW 18th location has more outlets. Nob Hill Pharmacy Cafe – Located on NW 21st, Pharmacy is probably Portland’s favorite 24 hour coffee shop. There is lots of seating to be found, but it does fill up quick. When you are done working, there are bars aplenty, in nearly every direction. I recommend the Zesty Cucumber martini at Bartini just next door. Backspace – Backspace is one of my favorite places is Portland, and not because it’s right around the corner from the office. Backspace is open until 2am, for you night owls. 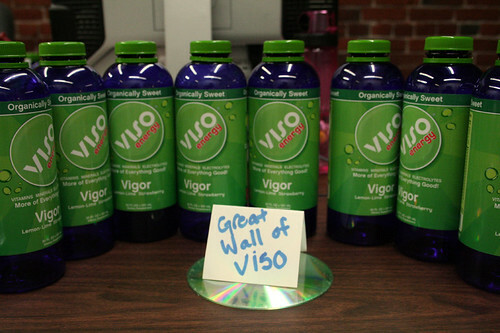 If you read our last installment of Portland Revealed, you will know that this is one spot to grab a Viso Vigor. Easy to get to by bus, but be warned, our neighborhood is currently a construction site. Don’t let that stop you from checking out Backspace, though. Hey, and if you need a break from work, head over to Ground Kontrol for some old (and some new) school arcade games. Want a glass of wine while you work, two doors down is Someday Lounge, a great new bar brought to you by the Backspace brothers and then some. It is easily one of my favorite bars in Portland. Fireside Lodge – The Fireside may not be ideal, but they are open 24 hours and it is usually a little less crowded than Pharmacy. The service is usually friendly, and the coffee is okay (but not great). Cubespace – Site of Portland’s first Barcamp, I had the chance to check out Cubespace last weekend. In fact, it was my first experience working in a cube, and while it may not be ideal for an everyday sort of thing, the space was pretty great for what I needed. Rent a cube for $10/hour or $40/day. They even have a soda fountain serving RC Cola and a cheerio/m&m dispenser. Souk – I haven’t been to Souk, which is right down the street from our office, but I know they are similar to Cubespace. I believe the desks are not cubed in, which means a little less privacy, but certainly less distractions than a coffee shop. Souk’s hotdesks are available for $10/hour. 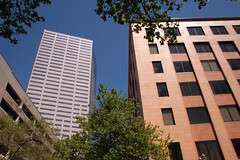 Pioneer Courthouse Square – Want to sit in the sun and work? Head down to Pioneer Courthouse Square (right on the MAX line), where you can enjoy being surrounded by downtown Portland and get free wifi. Couch Park – One of several Portland parks that has free wifi, though I can’t say I have tested it. Couch Park is in the lovely NW neighborhood with coffee, tea, and bars all nearby. Couch Park is also near a bus line, so it is easy to get to. Want just bars with wifi? Check out BarFly’s guide to wifi loving bars in Portland. 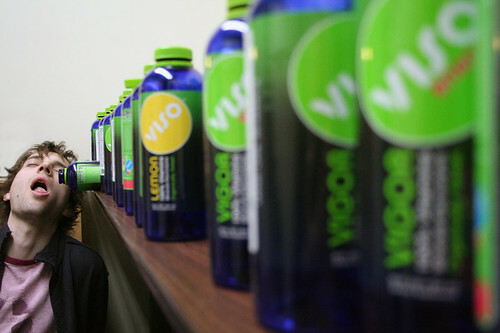 It was just two years ago that I discovered local beverage company, Viso (Visoda at the time), makers of the popular Vigor energy drink. It has since become a staple in the PLANET ARGON offices. Viso beverages taste great and are nothing like regular energy drinks. They’re sweet (but not too sweet), non-carbonated, and full of vitamins. You can also get a sugar free version, called Will. Non-caffeinated varieties available too. You’ll likely see me wandering the conference floors with one in my hand. As you can see, we take our Viso drinking… very seriously. Consider this a friendly tip from the locals, if you need a little pick me up that you can carry around in your bag, grab yourself a Vigor and join the ranks of the Portland caffeinated. In Portland Revealed: Episode 1, Gary gave a quick overview of some of Portland’s finer points. In this episode, we’ll go into more detail about some of the things to do outside while at the conference. We know at least a few of you are planning on spending a few days before and/or after the conference soaking up the city and surrounding areas that wanted to explore the lovely outdoor parts of Portland. It’s springtime in Portland and the weather has been great the past few weeks for lacing up your boots, running or walking shoes up and hitting the paths. We’ve kept this list to places within the city limits and easy to get to for conference goers. It would a crime to not begin this list with Forest Park, Portland’s pride and joy. As Gary mentioned in Episode 1, Forest Park is the largest, forested natural area within city limits in the United States. Since many of you will be taking advantage of our excellent public transportation system, you can actually get to several trails via Tri-Met, both the MAX and by bus. You could spend days wandering around all of the trails here. 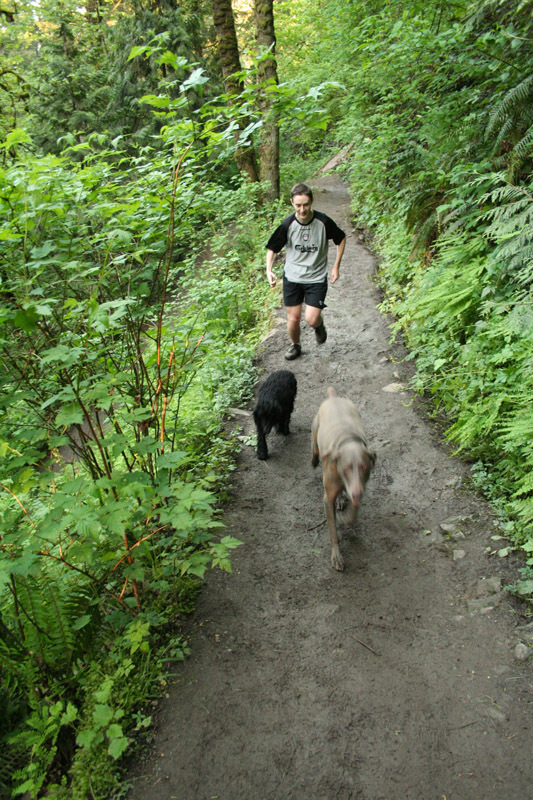 A few of us at PLANET ARGON have been known to go hiking and running around Forest Park in the afternoons/early evenings after a nice, long day of working with Ruby on Rails. For more information about Forest Park, visit Friends of Forest Park. Just a quick jaunt from the conference center and you’ll find yourself at Tom McCall Waterfront Park, on the Willamette River (pronounced wil-LAM-met). If you are a runner, try the waterfront run for an breezy 2.5 miles, which takes you down waterfront park, across the Hawthorne Bridge, up the Eastbank Esplanade, and back across the steel bridge. For more information and directions, visit here. If it’s sunny out, Waterfront Park also makes for a great place to lounge on the grass with a good book. If you make it farther into SE Portland, you might head over to Mt. Tabor Park, which sits atop an extinct volcano cinder cone. Don’t worry, we’re not expecting it to come back to life anytime soon, but be sure to check out the cinders “near the peak, where a basketball court and outdoor amphitheater are now situated, part of the cinder cone has been cut away, and is visible to park visitors. The remaining cinders were used to pave the nearby parking lot” (via wikipedia). Mt. Tabor is great for picnics, going for a jog, walking the dog, and getting a nice view of Downtown Portland (but you’ll have to make it to the top for this one). You can take the buses directly there, which makes it very accessible and a favorite among the locals. Lastly, for those of you looking for a more leisurely walk though a park packed with extra amenities, make your way to Washington Park in SW Portland. You can get there by bus, or MAX, with the Washington Park MAX station being the deepest transit station in North America, at 260 feet below ground! If the trails aren’t enough to keep you busy, you will not be short of things to do. Washington Park is home to the Oregon Zoo, the World Forestry Center, the Portland Japanese Garden, Hoyt Arboretum, and the International Rose Test Garden, with more than 700 varieties of roses. It’s just about to hit its peak of the season, so all you flower lovers, this is the perfect time! Best of all, the view of downtown from the Rose Garden is stunning, and on a clear day you can get a great view of Mt. Hood. We hope that you all enjoy Portland as much we do! RailsConf 2007 is just over a week away, and we have been asking ourselves “what should any new visitor to Portland know when they arrive?” Our answer? Where to get a pint (or three) of good Portland beer. In this second episode of Portland Revealed, we’re going to help you find some of the best beer in town. Many of you might not know that Portland has more local breweries than any other city in the world. In fact, just a few months ago, Tom Potter, Mayor of Portland, dubbed Portland (also known as the City of Roses) Beertown. “According to the Oregon Brewers Guild, no matter where you are in Portland, you’re never more than 15 minutes from a craft brewery.” Oregon consumes more local craft beer than any other state in the country. 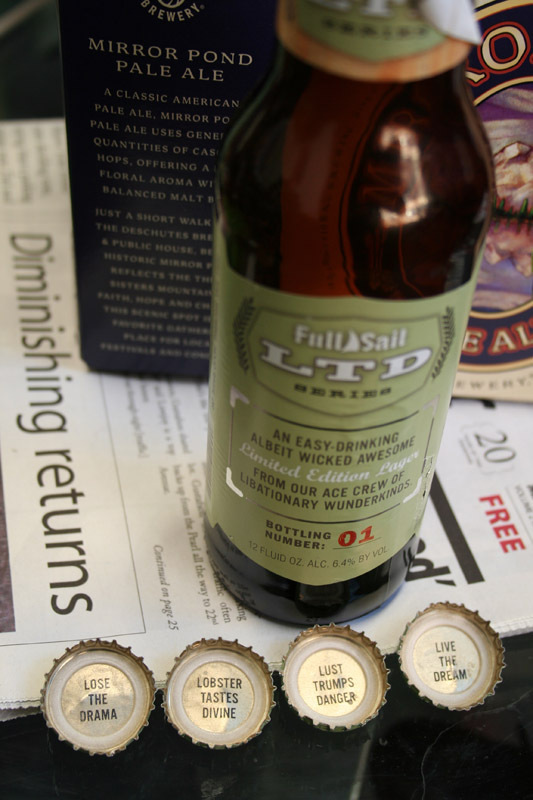 11% of the beer guzzled in Oregon is local, where the national average is only 3.5%! There is no doubt that we Oregonians (natives and transplants alike), love us some good local beer, and we think you’ll love our beer too! While in Portland, we suggest you take some time to get acquainted with our city’s beer options. We thought we’d help you get started by sharing some of our favorite spots (and most offer free wifi). McMenamin’s – A Portland staple, McMenamin’s can’t be overlooked. Our favorites spots for just a beer are The White Eagle and Ringler’s Annex. For beer, pizza and movies, check out Kennedy School in NE (the theater has sofas!) and the Bagdad theater on Hawthorne. Be sure to try their Ruby ale… and if you are feeling particularly Portlandish… ask for a Rubinator. Laurelhurst – Another great beer, pizza, and movies spot on 28th and E Burnside. Tugboat – Just around the corner from PAHQ, jvoorhis was the first to recommend this spot and it’s Alain’s favorite. Feeling brave? Try the Chernobyl Stout. New Old Lompoc – great outside patio in NW Portland, though this place gets packed pretty quickly on a sunny day. I am all about the Centennial IPA, "a classic Northwest IPA. Nicely balanced and easy drinking with all the hop flavors that Portlanders insist on. Rogue – Wouldn’t be a list of Portland beer without Rogue. Bridgeport – They claim to be the oldest craft brew in Oregon, and certainly shouldn’t be overlooked. Widmer Brothers – Want to drink Robby style? Order a Hefeweizen with lemon! Moon and Sixpence – If you’re just looking for a good English Pub to get a pint, Gary suggests the Moon and Sixpence in NE Portland, which is where he meets his fellow ex-pats meet to discuss the latest in the rivalry between Liverpool and Manchester United. Laurelwood – Two locations, though we recommend the one in NW (unless you like a more family style atmosphere). They also have good food. Yum! A Roadside Attraction – You might not guess it from driving by, but Daniel swears by this spot for a pint and a patio. Plus, it’s non-smoking. Lucky Lab – this is where PDX.rb meets after monthly meetings. There are several locations, but our favorite is the original on Hawthorne. 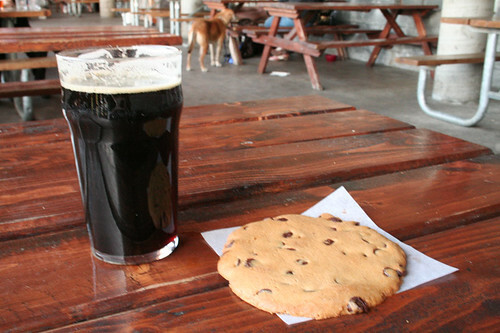 If you’re feeling in the mood for a pint of beer and a cookie, this is the spot! If you are interested in grabbing a beer with some of us during the conference, stop by our IRC channel or contact us on our site (select “RailsConf Meetup” for the inquiry reason). As Portland prepares for an influx of Rails enthusiasts, Robby is getting warmed up for the Business of Rails panel, where he will be joined by other Rails business leaders to talk about what it takes to be a successful Rails consultant. For those of you in the Czech Republic, be sure to catch up with Robby at Ostrava on Rails in June, where he will be making a Business Case for Rails. Not going to make it to Portland or Ostrava? No need to feel left out, Robby has promised a series of blog posts, also titled a Business Case for Rails. It’s a beautiful day in Portland, let’s hope the sun stays around for all of you heading our way. We look forward to talking with you about the Business of Rails. It’s been year since I announced our Rails Business Hosting, and it has been a popular hosting choice for many of our customers. We’ve been hard at work designing a new hosting service, which aims to provide you with even more privacy, more guaranteed resources, and better options for scaling your Rails application as your business grows. In the coming weeks, the PLANET ARGON team will introduce Boxcar, an exciting new hosting service that has been designed, developed, and fine-tuned over the past several months. In the meantime, check out the new Boxcar site, launched this morning by our designer in residence, Chris Griffin. Sign up on our mailing list to be one of the first to find out when this new service is available for public consumption. You can also stay tuned to our blog, as we’ll be posting more updates over the coming days and weeks as we prepare for our launch! Rails the #1 technology to know in 2007? Earlier today, ComputerWorld published an article that lists what they believe are The Top Five Technologies You Need to Know About in ’07. In this article they list the following. That’s right! You might have noticed that ComputerWorld has named Ruby on Rails, our development framework of choice, as the top technology to know about in 2007! It’s great to see that the technology that we decided to adopt over two years ago is still making big headlines! 5 mistakes your company blog should avoid. It’s Presidents Day 2007 here in the US and what better way to celebrate than to highlight some of the things our presidents have said? Here are a few of our favorite quotes.